Front yard looks looks like a failed flea market. More and more junk keeps piling up. This woman thinks if you put a plant in a toilet or car tire that it becomes ''yard art''. They have a fenced back yard and garage. I asked her to move her stuff to the back yard but she said the dogs have taken over the back yard and that her friends think it looks nice... Ok how about the motorcycle they don't use, why not put it in the garage?? They park on the yard and sit on the driveway. Front yard looks trashy like Sanford and Sons..I have a picture of when I used to live there! Nice and tidy! Best it ever looked! But I can only post 1 pic though..I really wanted to show before and after pics! 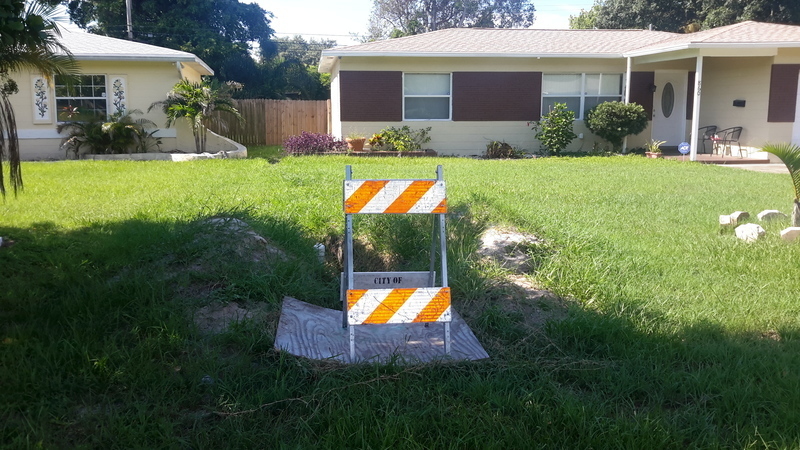 Update from the Codes Compliance Department: the reported issue was previously investigated at this location and was found to either be in compliance or unable to cited. Please read the case comments by clicking the link below and if anything has changed that would result in a new violation please let us know by contacting the assigned investigator. This is what it looked like when I lived there, the neighbors loved me. As you have been advised previously, SeeClickFix is not the appropriate venue for posting issues related to Law Enforcement - you would need to reach out to the SPPD directly, or you may contact an attorney. Your correspondence sent to the Mayor's Office has been forwarded to the attention of the SPPD. I am sorry but I disagree; the City and the Mayor's Office are responsible for the well-being and safety of their residents and citizens, and I was advised by FDLE to contact the City and Mayor's Office for assistance. I am not doing anything wrong, and I am only asking for assistance from the City and Mayor's Office simply due to the fact that SPPD is not willing to respond to my inquiry of why their officers and Records Dept are not following the Laws and Statues of the State of Florida. If the Mayor's office is not interested in adhering to the Laws of this State, then I find that to be a conflict of the Mayor's responsibilities and obligations to the very Residents who voted him in office. Giant rv trailer parked in yard right on 38th ave.
Maybe they have visitors for the holiday! or call 727-893-7373 and refer to the above case number, 18-16819. City was waiting on property owner to have repairs done to fix sewer line, repairs have been made and they are waiting on City. Photo for file - send to wastewater for follow up.